I <3 Action!. Action and Adventure are my middle names! If the world is in trouble, my New York heroes Jake Long and the Penguins are here to save the day!. HD Wallpaper and background images in the American Dragon: Jake Long club tagged: photo american dragon jake long the penguins of madagascar kendall dragon new york action i heart fanpop. 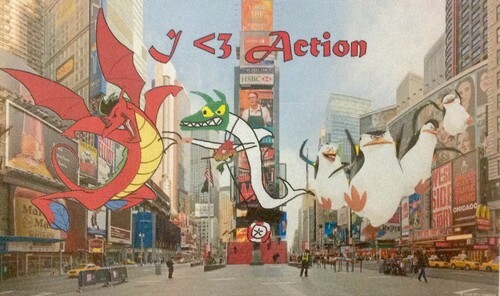 This American Dragon: Jake Long photo might contain straat, stad scène, stedelijke omgeving, stad straatbeeld, stedelijke instellen, anime, grappig boek, manga, cartoon, and stripboek.